Box Foolscap File Cloud (Pack of 10) WX20012 Pack of 10 Foolscap box file ideal for storing loose papers. Finger ring on spine for easy retrieval. Strong lid clip for keeping file closed. Internal spring clip secures your documents. Ideal for archiving. black with cloud finish. 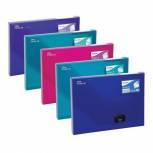 Q-Connect 75mm Box File Foolscap Blue (Pack of 5) 31813KIN0 Pack of 5 Q-Connect Coloured Box File. Softwood constructed box file, fitted with a lid clip, internal spring clip, spine label and finger ring for easy retrieval. Suitable for use with both A4 and Foolscap papers and documents. Colour - Blue. 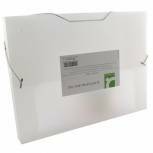 Q-Connect 75mm Box File Foolscap Green (Pack of 5) 31814KIN0 Pack of 5 Q-Connect Coloured Box File. Softwood constructed box file, fitted with a lid clip, internal spring clip, spine label and finger ring for easy retrieval. Suitable for use with both A4 and Foolscap papers and documents. Colour - Green. 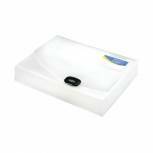 Snopake 35mm Document Box A4 Clear 12861 Pack of 1 Manufactured from heavy gauge polypropylene and welded for strength. Strong push-lock for added security. Cutaway front for easy access and business card holder. 35mm capacity. Clear. 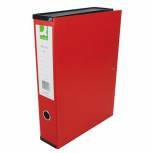 Q-Connect 75mm Box File Foolscap Red (Pack of 5) 31818KIN0 Pack of 5 Q-Connect Coloured Box File. Softwood constructed box file, fitted with a lid clip, internal spring clip, spine label and finger ring for easy retrieval. Suitable for use with both A4 and Foolscap papers and documents. Colour - Red. 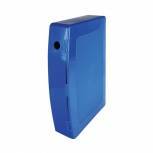 Q-Connect Polypropylene PolyBox File Foolscap Blue KF04103 Pack of 1 Q-Connect Poly-Box File. Manufactured from strong polypropylene, featuring a curved front for easy access and an optional internal spring holding mechanism. Accepts up to foolscap papers and document wallets. Colour - Blue. 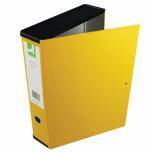 Q-Connect 75mm Box File Foolscap Yellow (Pack of 5) 31819KIN0 Pack of 5 Q-Connect Coloured Box File. Softwood constructed box file. Lid clip. Internal spring clip. Spine label and finger ring for easy retrieval. Suitable for use with both A4 and Foolscap papers and documents. Colour - Yellow. 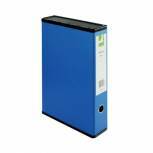 Q-Connect Elasticated Folder 25mm A4 Blue KF02307 Pack of 1 Q-Connect Elasticated Box File, hard wearing and stylish. Elasticated closure ensures documents are kept together securely. Capacity 25mm. Colour - Blue. 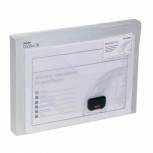 Q-Connect Polypropylene PolyBox File Foolscap Black KF04102 Pack of 1 Q-Connect Poly-Box File. Manufactured from strong polypropylene, featuring a curved front for easy access and an optional internal spring holding mechanism. Accepts up to foolscap papers and document wallets. Colour - Black. 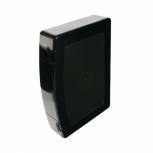 Snopake 25mm Document Box A4 Electra Assorted (Pack of 5) 14832 Pack of 1 Strong push-lock for security. Cutaway front for easy access. Business card holder. 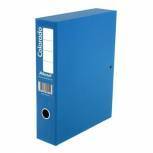 Ideal for storage of loose papers and Snopake A4 Polyfiles. A4 25mm capacity. Assorted Electra colours. Pack 5. 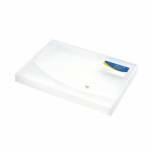 Rapesco Rigid Wallet Box File 60mm A4 Clear 0714 Pack of 1 Rapesco Wallet Box File. Heavy-gauge polypropylene box files with welded sides. Business card size holder on the front for personalisation and push lock closure. Capacity - 60mm. Colour - Clear. 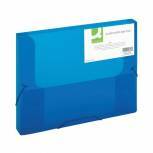 Concord IXL Selecta Box File Foolscap Blue (Pack of 10) 264152 Pack of 10 IXL Box File Foolscap. Accommodates A4 and foolscap document wallets. Contents secured with a firm lockspring and strong lid catch. Blue. 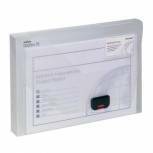 Snopake 25mm Document Box A4 Clear 12849 Pack of 1 The latest concept in document storage. 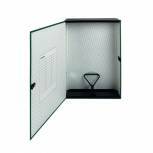 Made to last boxes are manufactured from heavy-gauge polypropylene and are welded for strength. 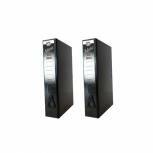 25mm capacity with strong push-lock for security, a cutaway front for easy access. Clear. Q-Connect Elasticated Folder 25mm A4 Clear KF02310 Pack of 1 Q-Connect Elasticated Box File, hard wearing and stylish. Elasticated closure ensures documents are kept together securely. Capacity 25mm. Colour - Clear. 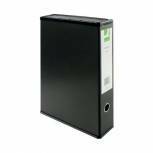 Rexel Classic Box File Lockspring A4 Black (Pack of 5) 30145EAST Pack of 5 Classic A4 Box File. 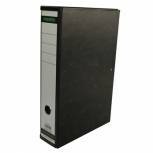 Traditional box file designed for strength and long life. Features include a mottled Black and Green hard wearing cover. Lip clip and plastic lockspring keep contents secure and printed index on the lid. 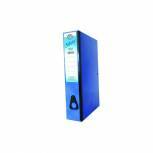 Rexel Colorado Box File A4 Blue (Pack of 5) 30443EAST Pack of 5 Securely stores up to 700 sheet of paper. A4 size with lock spring clip for security of papers. Large spine label for easy identification. Finger ring for easy shelf retrieval. Blue. 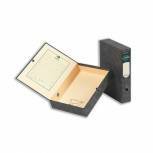 Rapesco Rigid Wallet Box File 25mm A4 Clear 0708 Pack of 1 Rapesco Wallet Box File. Heavy-gauge polypropylene box files with welded sides. Business card size holder on the front for personalisation and push lock closure. Capacity - 25mm. Colour - Clear.